Great Food. Great Service. Great Fun. Easy for you. Welcome to Anytime German at The Sherman. 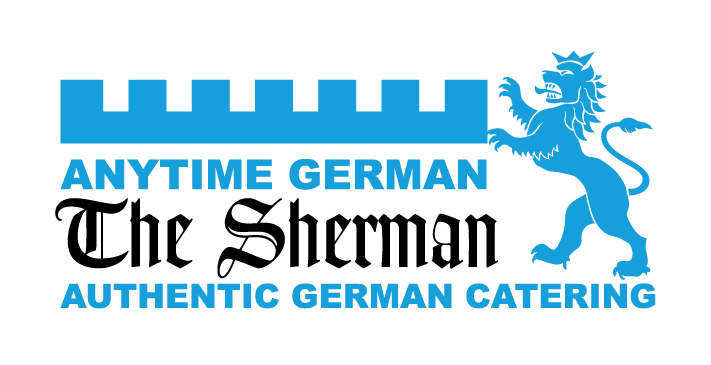 Please allow three (3) full days prep time for all our German-Sherman catering orders. This menu is recommended for groups about 10 or more. For smaller groups or shorter waiting times, you may want to order from our BOX LUNCH TO-GO menu or directly from our LUNCH, DINNER, or EARLY DINERS menus. Just the right mix of sweet onion and tangy garlic. A sure pleaser to start your event off right. Two of our favorites, sour dough and rye, are lightly buttered and toasted to perfectly complement our Bier Cheese. Salted, soft and chewy on the inside with slightly crusty exterior – eat alone, with butter, bier mustard or with our house-made Bier Cheese. Golden beets, green cabbage, carrots, yellow potatoes and our own chicken stock. Served with whipped sour cream (optional). Tongue-tantalizingly creamy with pureed broccoli and Bitburger Bier simmered gently – guaranteed to leave empty bowls behind. Roasted chicken, our own chicken stock, a Spätzle-type dumpling, celery, onion and old world spices simmered for hours for a flavorful light meal or to complement an entree. Healthy and hearty. Melt-in-your-mouth, bite-size chunks of tender beef with carrots, paprika spices etc., produces a savory soup reminiscent of the originating recipe from the medieval Kingdom of Hungary. Served with sour cream (optional). Served with three delicious mustards. Savory pork delivering a juicy, tangy flavor. Served with three delicious mustards. Offers a delicious variation of the tang from our regular bratwurst. Served with three delicious mustards. Applewood smoked pork around a real cheddar cheese core. An instant favorite. Smaller pork sausages seasoned with marjoram for a distinct, sweet and juicy taste. Recommend serving with sauerkraut for a traditional German complete meal (purchased separately under Sides Dishes). A delicious vegetarian delicacy with spinach, cream cheese, and spices stuffed in our homemade ravioli and topped with frizzled onions. Using an 100-year-old Austrian-German recipe of onion, garlic, caraway seeds, paprika, and other spices, our seasoned kraut is combined and gently simmered with pork tenderloin. Served with seasoned boiled red potatoes. This is a larger portion than when ordered as a soup. Melt-in-your-mouth, bite-size chunks of tender beef with carrots, paprika spices etc., produces a savory soup reminiscent of the originating recipe from the medieval Kingdom of Hungary. Served with sour cream (optional). Served with white rice. Large chunks of roasted chicken in a robust Swiss-German white wine sauce that tastes ever-so-slightly tangy. Expect requests for seconds or even thirds with this one. Pulled roasted chicken sautéed with onion and sliced mushrooms tossed in a light Marsala Cream Sauce. Served with Spätzle. Rich and satisfying. Grilled seasoned chicken breasts topped with our Bavarian Bier Cheese served with sautéed peppers and onions. Two thin-sliced, house-breaded pork cutlets, fried crisp and golden brown. Ultra-tender, German-style roast braised and marinated in a rich tangy-sour red wine sauce. Bier-braised chuck pot roast served with gravy and a hint of bay leaf. Fit for a King (or a Queen). Thinly sliced beef rolled around juicy bacon, onions and pickles in a broth that is made into a creamy rich sour-cream gravy. True old-world savory for when you really want to impress your guests. Starting with our favorite Munich-burger house blend of ground beef and pork, which delivers a mouth-watering hearty meat flavor, we mix in onions, garlic and other savory vegetables. This is a meatloaf-lovers dream come true. Blackened Faroe Island Salmon with Port Wine glaze makes for a fancy and flavorful meal. Sauteed spätzle (dumplings) with our creamy three-cheese blend topped with frizzled onion and fresh chives. Potatoes first boiled, then peeled and finally fried with spices. Cooked potatoes mashed and then mixed with flour and egg, shaped into a ball and boiled. Mixed greens, cucumber, grape tomatoes, red onion. With homemade graham cracker crust. or send an email to Info@The-Sherman.com. Bavaria a region in Southern German known for its unique dialect, King Ludwig who built dozens of castles and most famously, for inventing OKTOBERTFEST. Boehringer in 1859, German immigrant Henry Boehringer became Batesville's first major builder. A three-story building with a basement on East Pearl Street (formerly known as Broadway Street) became known as the Boehringer Hall because of the dance floor on the third story. The Sherman honors his memory and accomplishments with a banquet hall and exclusive ranch dressing named after Mr. Boehringer. Borscht a soup popular in several Eastern European cuisines. The variety most commonly associated with the name in English is of Ukrainian origin and includes beetroots as one of the main ingredients. Our variation takes a German spin, and uses golden beets, which deliver a milder flavor than traditionally used red beets. Borscht derives from an ancient soup originally cooked from pickled stems, leaves and umbels of common hogweed, a herbaceous plant growing in damp meadows, which lent the dish its Slavic name. Ours is made by combining our house made chicken stock and vegetables, which includes beets, green cabbage, carrots, yellow potatoes and spices. Bratkartofflen Potatoes first boiled, then peeled and finally fried with spices. Potato Dumpling Cooked potatoes mashed and then mixed with flour and egg, shaped into a ball and boiled.